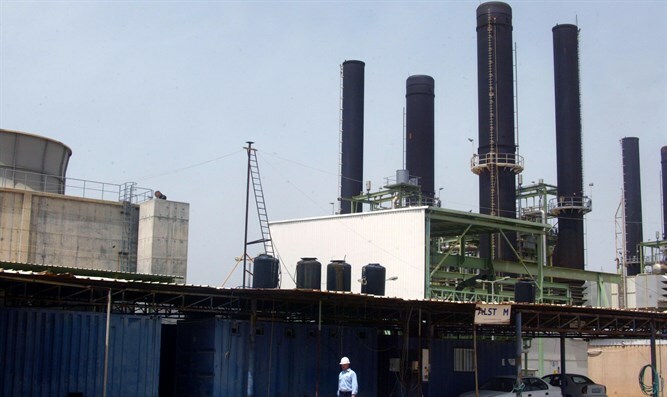 Hamas terror group claims Qatar providing fuel for Gaza Strip's power plant as conditions under Hamas rule deteriorate. on Tuesday in a bid to alleviate conditions in the Hamas-controlled enclave, a spokesman for the terror group said. The delivery could help ease months of deteriorating conditions under Hamas rule in the coastal enclave, as a political standoff between the Palestinian Authority and Hamas continues. The transfer of fuel by Qatar was met with criticism by officials close to Palestinian Authority chief Mahmoud Abbas, whose rival administration was not involved. Hamas and Israel. Israeli officials however refused comment on the delivery. A source at the Kerem Shalom crossing in southern Gaza -- the only goods crossing between the Gaza Strip and Israel -- said six trucks carrying 450,000 liters of fuel crossed Tuesday. AFP journalists saw at least one truck arriving at the power station in Gaza City. "The Qatari fuel to the Gaza Strip's power plant today is aimed at partially improving electricity (supply) in Gaza," Hamas spokesman Hazem Qassem told AFP. For months residents of the strip have been receiving only four hours of mains electricity a day on average. Under a UN-brokered deal, Qatar pays for the fuel which is then delivered through Israel with United Nations monitoring, a diplomatic source said. Hamas seized control of Gaza from Abbas's Palestinian Authority in a 2007 near-civil war. Abbas says that making deals with Hamas amounts to recognizing their control over Gaza in place of the PA.
Israeli Prime Minister Binyamin Netanyahu said Tuesday that Abbas was exacerbating Gaza woes and thereby fuelling its residents' aggression toward Israel. "Abu Mazen [Abbas] is strangling them economically and they lash out at Israel," he told a press conference in his Jerusalem office, referring to Abbas by his Arabic nickname. Netanyahu did not specifically refer to the oil shipment but spoke of "attempts to reach a practical solution so that he will stop this strangulation."